A hard-running, pacy outside-centre, Horne graduated quickly through the ranks of Australian rugby, moving from Schoolboys to Sevens level between 2007 and 2008, when he also made his Super 14 debut with the Waratahs. Months later he started the Tahs' final loss to the Crusaders in Christchurch before making a mark with Australia at Under-20 level. In November 2009 he made the full Test squad for the first time, touring Europe, but waited until June 2010 for his debut cap, against Fiji in Canberra. He subsequently started Tests against England, twice, and Ireland as well as Tri-Nations meetings with South Africa and New Zealand. In the second, a big defeat in Melbourne, Horne fractured his elbow and was ruled out of the remainder of the tournament. Elbow problems continued to trouble him throughout the 2011 Super Rugby season but he still had time to commit to the 'Tahs until the end of the 2013 season. The round three injury against the Crusaders effectively ended his campaign and made he was in a race against time to get back into Wallabies recognition ahead of the World Cup. However, coach Robbie Deans gave him the benefit of the doubt and named him in the 30-man squad for the showpiece tournament. 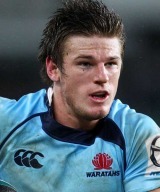 Horne was used sparingly during the World Cup and tried to kick on during the 2012 Super Rugby tournament. He impressed Deans and started all three of Australia's Tests against Wales scoring in the second and third match.